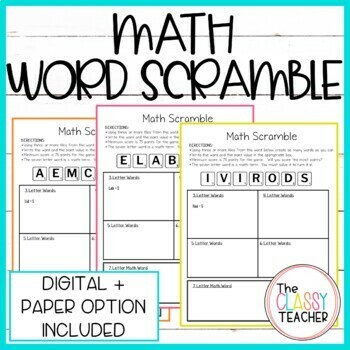 A set of 10 scrambles using math terms. Students create as many words as they can with the given letters, but must figure out the 7 letter math term. This is great for early finishers. Want to earn TPT Credit for future purchase? Go to your "My Purchases" Page. Under each of your paid purchases you will find the "Provide Feedback" option. Click it and you will have the opportunity to rate each of your purchased product earning credit to be used for future purchases. This product may be used by you for your own personal use or in your classroom. If others are interested, please direct them to my TPT store where you can purchase additional license for a discounted price. You may not post this product anywhere online that would give others access. Thank you for respecting my work.